The greatest things about skateboards are their extreme mobility and portability, but there’s always room for improvement – even in the most tried-and-true designs. The FreeRider SkateCycle from Brooklyn Workshop takes the nimble skateboard and turns it into an even better transportation device. The hubless skateboard features a flexible midsection, letting it flex and bend with the user’s body movements. The flexibility of the FreeRider’s middle means that it’s simple to round corners or navigate crowded city streets. It weighs a mere 7.3 pounds and can bend in the middle to sit on the shoulder, leaving both hands free when you’re walking around. The FreeRider definitely has an appealing aesthetic…but will it appeal to die-hard skateboarders? 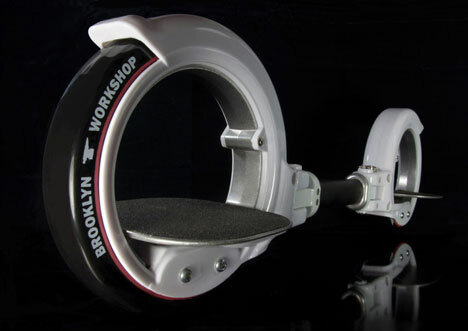 It isn’t capable of performing all of the tricks that skaters love to perform due to the rider’s feet resting inside of the wheel rings. But for getting around campus, zipping quickly to work or just getting out for a bit of sightseeing, the FreeRide looks like a simply cool way to haul your body. 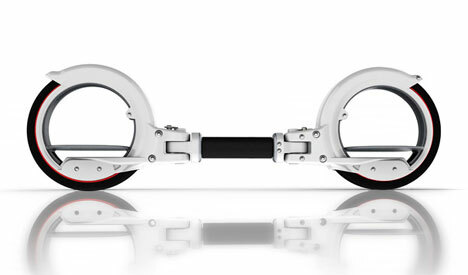 It’s not just a concept, either: the FreeRider Skatecycle is available now for around $150. See more in Bikes & Cycles or under Transportation. October, 2010.